Joining Mix magazine in 1993 as its live sound editor, he continued working as an independent engineer, with projects including the Metropolitan Opera, the Pope's visit to Giants Stadium, Tony Bennett's 'Unplugged' tour, Atlanta Olympics basketball, assisting Pavaroti and the Three Tenors, monitors for Joni Mitchell's symphony tour, a decade working with ATK at the Super Bowl and a decade mixing monitors for k.d. lang. 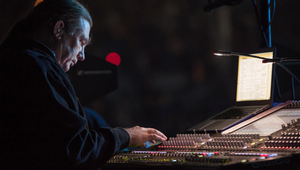 After 4 years with Live Sound International magazine, Mark was Editor for Front of House for 12 months, followed by a couple years of mixing IEMs for Zac Brown Band. When not on the road, Mark does sound for the Jacksonville Symphony and writes.